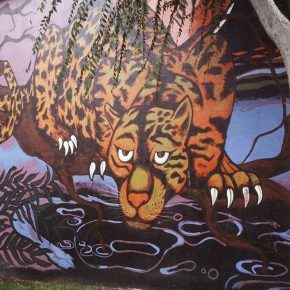 While growing up in the East Los Angeles neighborhood of Echo Park in the 1970’s, future photographer Sedona Callahan often practiced by shooting the murals that decorated her community. She may, or may not, have known she was documenting a significant and fragile historical moment for the Mexican-Americans of Los Angeles and the history of Mexican art. With her single lens reflex Leica camera Callahan photographed a swiftly disappearing phenomenon that she was subsequently able to transfer to digital images and restore to “like-new condition,” thus bringing the “spirit of the Chicano” to Salt Lake City. 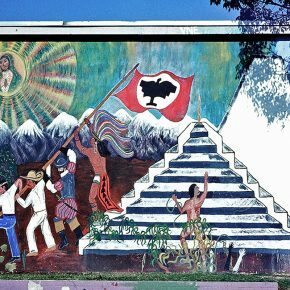 Like the “golden age” of mural art in Mexico City in the 1920s, centered around Diego Rivera and with its own purposes and idealism, the Chicano mural movement in Los Angeles represented specific aims and had its own purposes and ideals. Like that other golden age, these monumental works of the 1970’s united for a time the spirit of a culture and an identity for its people. Many of these works from the 1970’s have long since disappeared, victim to a changing urban community and to the elements, yet evidence of these ephemeral documents that represent transcendent realities remain in the collection of photographs currently showing at the Mestizo Coffeehouse and Gallery. Callahan has also brought these images together in a book that adds a sense of historical significance to this relevant episode in the history of Mexican art and culture. 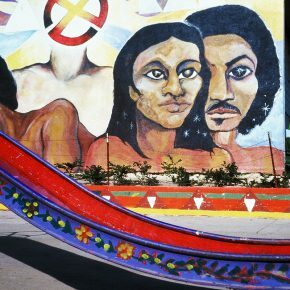 To discover a more eloquent idea of “the spirit of the Chicano,” one might look at these historic murals, which materialize the sprit of Chicanoism as vibrantly and vitally as the murals in Mexico City unequivocally expressed what it meant to be Mexican in the era of the Revolution and Mexican socialism. Like with the works of Rivera and his followers, to understand the Chicano mural movement, its iconography and symbolic language, the layers of meaning and revealed truths, is to understand the history of the spirit of the Chicanoism, its past and its present. These photographs are a documentation of a spectrum of principles that motivated a nation and led to many of the reforms that are still seen manifested today. Of the many murals photographed in this exhibit, some are more decorative than others, but all have specific utilitarian purposes. 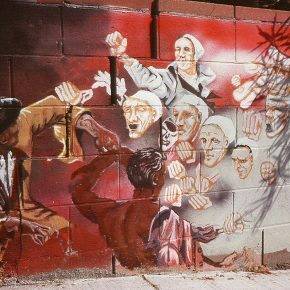 One that is very overt in its aim is the nostalgic “Ghosts of the Barrio,” painted by Wayne Healy in 1974. This mural is done on the side of a home or small business and represents the essence of the Chicano male, past and present. The mural features trompe l’oeil steps on which representations of seven types of Mexican men sit or stand, presenting models of the ideal man in his many forms. Depicted from the distant past is a Mayan warrior, a Spanish conquistador, a Mexican cowboy (the vaquero or the charro), a worker, a “macho” type in T-shirt and slacks, sporting a mustache and muscles, an intellectual, and centered among them a conventional Mexican as he might have looked when the mural was painted, with tank top, jeans and cowboy hat. This mural makes Chicano 101 visible, being definitive of all things male in Mexico, from the historical background to the intellectual, to the “macho” man and to the prototypical contemporary Mexican male. 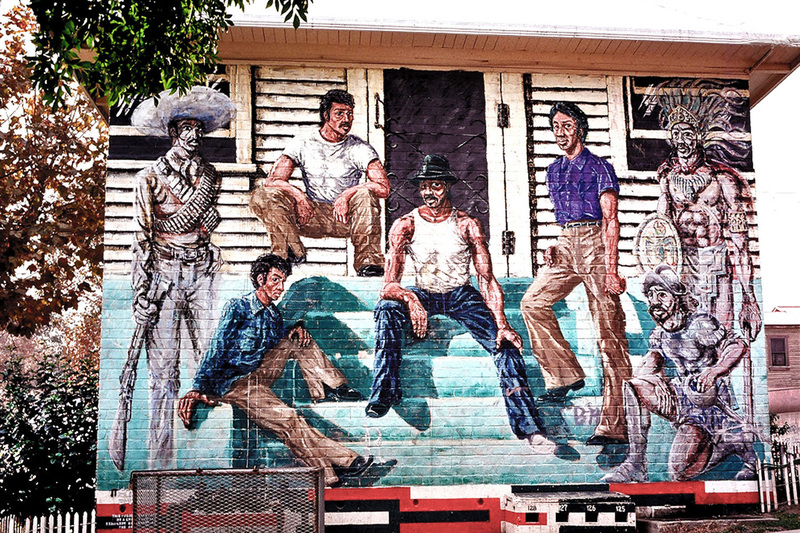 For a culture struggling to maintain its identity and traditional cultural values in a country where the majority sees them as foreign, whether they have immigrated recently or been in the land for centuries, this mural presenting all shades of the Mexican male is nothing less than iconic. In a mural similar to ones done by Rivera and his followers in the 1920s, dealing with subjects like equality, hope, and possibilities within socialism, “Tribute to the Farmworkers,” painted by Alejandro C. Maya in 1974, has those elements that define the “spirit of the Chicano” in a tribute to the unity of the Mexican worker and the socialism that was then the essence of populist Mexican thinking. In this mural again are types that represent the totality of socialist Mexico and the unity they desired, never better embodied than in the worker. This was true to the art and times of Rivera, true in Los Angeles in 1974, and remains true today. In this image are four prototypal Mexican “workers:” a Mayan god, a conquistador, a laborer with sombrero, and a contemporary Mexican man, again seen with blue jeans and T-shirt. The four are elevating a flag and stand in a field with mountains in the rear, a Mayan pyramid, and a vision above of the Virgin of Guadalupe in an aureole of light. It is a composition full of meaning and intent and surely was meant to inspire and unify the Mexican people—La Raza—in Los Angeles in the 1970s with the “spirit of the Chicano.” It, and the other murals in the exhibition, are as significant today in Salt Lake City as they were in Los Angeles four decades ago. Sedona Callahan: Art and Soul, a retrospective photographic look at original murals made in East Los Angeles created in the 1970s, is at Salt Lake’s Mestizo Gallery through April 8th. Sedona Callahan’s book of the photographs is available at blurb.com. Thanks for doing this article. I have just one small critique on using Mexican American and Chicano interchangable. The term “Chicano” came out of the moratorium where we were deciding whether we wanted to be called Mexican American or Chicano. (I say “we” as a the next generation Chicana, but of course, I was barely alive when this was all decided by my people) Mexican American had a split identity where we didn’t feel much acceptance from Mexicans (from Mexico) nor White Americans. We chose the term “Chicano” deriving from the Indigenous Mexikas who inhabited this land before migrating South. They called themselves Mexikanos, and were stereotyped poorly by the Spaniards. Therefore, we decided to call ourselves Chican@s or Xican@s deriving from MeXikano due to the parallel experiences of colonization, yet, to reclaim it with dignity, pride, and sense of identity. I would also like to add that these murals are not only part of Chican@ history but also part of American history (just as Women’s Liberation is part of American history, fighting for equality…so too are these murals a reflection of not only identity but the impact of inequality for people of color striving for social change and access). Again, thanks so much for writing this article. Thanks to Sedona for taking the photos. Overall, good article. Thank you, Ehren Clark, for such an insightful article about my exhibit and book. Like Ruby, I also have a comment. It appears from this article that I was a child (with a Leica!) randomly taking pretty pictures. In fact I was an adult, already established as a photographer, and yes, I knew what I was doing. Secondly, a quote that was attributed to me, beginning with “These murals were created…” was a quote I had attributed to Centro de Arte Popular in Los Angeles in the introduction to my book “Art and Soul”. Those were not my words. The value of this collection, for Los Angeles’ Chicano community, for Utah’s growing Latino community, and for all people of the United States, is that this is a part of our collective history, as much as the Civil Rights Movement, which preceded the Chicano Revolution by just a few years. What impacts some of us impacts all of us. As to your drawing the connection between the murals of East Los Angeles and those of the Mexican muralists of the mid-20th century, you illustrated that link much more eloquently than I did. Ruby Chacon and Sedona Callahan’s comments reveal something of what it takes to write for 15 Bytes. Not only does a review require going to see a show and having an opinion: no, it also requires a lot of background knowledge on art history and movements, plus sensitivity to the issues and identities that concern artists and audiences. In order to even come close to success, writing that appears in 15 Bytes is always read by several staff members, increasing the amount of work we do. But it’s still not finished. We need informed, sensitive collaboration from audience members — like Ruby and Sedona. That’s your part as readers. We hope you will write and tell us what you think about art and how we’re doing. You can also help by following the link from the blog to our donation page and making a contribution to help defray our expenses. We don’t get paid, but we can’t even donate our effort if we can’t pay for the cost of producing and broadcasting 15 Bytes. Geoff, I agree with everything you have stated above. I would like to add one more piece of the puzzle of crafting an informative, captivating and accurate article. Talk to the artist. If I had been contacted, some of the misconceptions could have been clarified very quickly. My contact information was included in the book Art and Soul, and was available at Mestizo. With that said, it was still a good article.